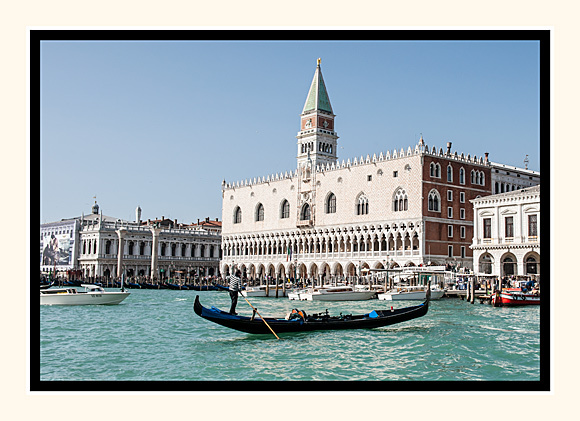 The Gondola is a traditional, flat-bottomed Venetian rowing boat. The gondola is propelled like punting, except an oar is used instead of a pole. There were approximately eight to ten thousand gondolas during the 17th and 18th century, it was the main means of transportation within Venice. Today in active service there are about four hundred, mostly used for hire by tourist. There are a few privately owned. Gondolas are handmade using 8 different types of wood, they are made from 280 pieces. The oars are made of beech wood. The left side of the gondolas are made longer than the right side, this makes the gondola resist the tendency to turn towards the left at the forward stroke of the oar. The Gondola today has become publicized as the Icon of Venice.